The longer the increasingly rapid progress of robotics technology development. Coupled with the ideas and creative thinking of its creator, Will add this course Creativity and Innovation That Affect the robot creation. Something extraordinary seems to be pursued and developed by one of the famous Japanese company is Toyota. And from information obtained, it turns out this Toyota has succeeded in creating a Humanoid robot that can run like humans do. This robot is indeed impressive. Just imagine, this robot can run fast. And when tested, turned out the Toyota claims that it created a robot is capable of running more than 7 miles per hour. 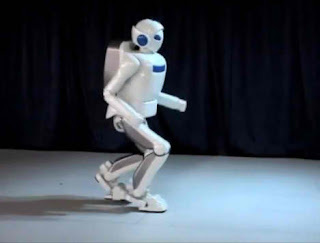 In other words, Humanoid robots are capable of running faster than the robot Asimo. You could try a humanoid robot the ability to run this? Go ahead!